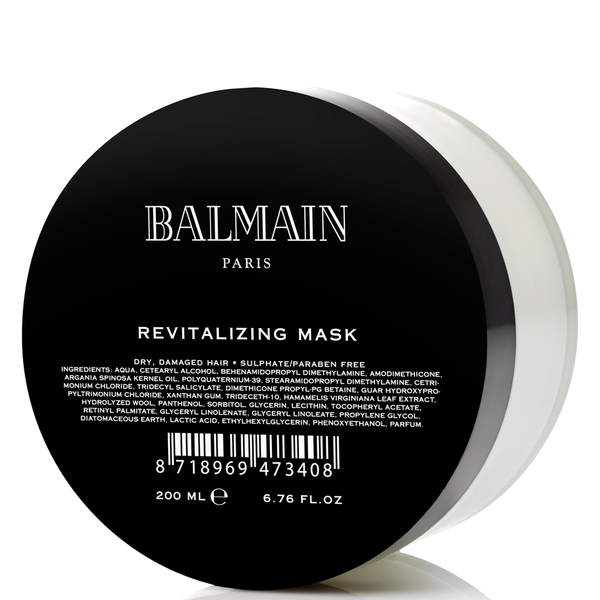 Catering specifically for dry, damaged hair, the Revitalizing Mask from Balmain Hair restores and replenishes locks from root to tip. Infused with Argan Oil; recognised for its nourishing and rejuvenating properties, the innovative mask penetrates deep into hair to repair from within. Rich in Vitamins E, F and P for superior antioxidant protection, the regenerating treatment strengthens and restructures hair fibres, whilst Cashmere and Silk ingredients restore lustrous shine. Expect silky smooth, healthy-looking locks that are bursting with vitality and moisture. Apply to towel-dry hair, massage softly and leave it for 5-10 minutes and rinse thoroughly. Aqua, Cetearyl Alcohol, Behenamidopropyl Dimethylamine, Amodimethicone, Argania Spinosa Kernel Oil, Polyquaternium-39, Stearamidopropyl Dimethylamine, Cetrimonium Chloride, Tridecyl Salicylate, Dimethicone Propyl-Pg Betaine, Guar Hydroxypropyltrimonium Chloride, Xantan Gum, Trideceth-10, Hamamelis Virginiana Leaf Extract, Hydrolyzed Wool, Panthenol, Sorbitol, Glycerin, Lecithin, Tocopheryl Acetate, Retinyl Palmitate, Glyceryl Linolenate, Glyceryl Linoleate, Propylene Glycol, Diatomaceous Earth, Lactic Acid, Ethylhexylglycerin, Phenoxyethanol, Parfum.